Caroline studied at Bath Academy of Art and in Florence for three years with Nerina Simi, receiving the Delta Metal Scholarship Grant for her final year. She has exhibited in mixed exhibitions in Yorkshire, the Cotswolds and London including at the Osborne Studio Gallery, and with WH Patterson in their ‘Venice in Peril’ exhibition, and has had solo shows in London and Wiltshire. She won the ‘Graham North’ prize for the best Hunting picture at the Society of Equestrian Artists exhibition at the Mall Galleries in 2007. 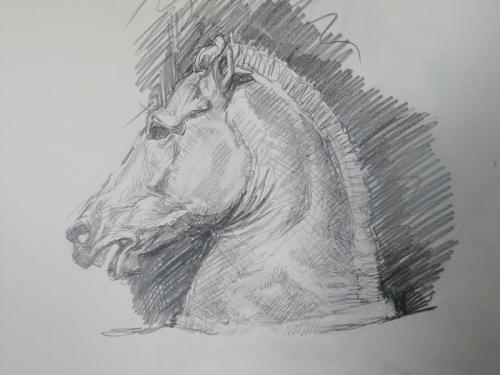 More recently she has concentrated on sculpture to be cast in bronze, winning a commission to sculpt the head of the New Zealand Event horse ‘Clifton Promise’ who won Badminton Horse Trials in 2013. The Society of Equestrian Artists updated their cover photo. © All Images and biographical information is reproduced on this site with the permission of the artists and remain strictly copyright of the artists. Every effort is made to ensure the accuracy of information on this site. However, neither the Society nor the Webmaster accept any responsibility for any inaccuracies, or their implications, howsoever caused.